Most of what we do is based on growth. Moving materials across the surface of the earth, then moving them back again. We watch the news on television and hear about shares of the markets, quotas, targets, jobs, cuts, unemployment. Most of what we hear about is more production of material goods, getting people to spend and about expanding our share of the market. Constant growth as well as making the few rich is smothering the rest of us. It creates jobs we are told. Anything can be done, any crime perpetrated it would seem, if it creates jobs. In our place of work we will be constantly squeezed to improve efficiency to facilitate more growth, displaced by machines, casual labour, odd hours to increase productivity leading to more growth. You come to realise all this sacrifice, extra work and growth doesn’t make your life any better because constant growth is only to facilitate shareholder profits and nothing else and wages and conditions are seen only as a drain on profits. But it creates jobs, is always the rallying cry! As we travel to our place of work, more than usually to sell services, make and distribute materials, we pass others traveling in the opposite direction, miles from where they live and some of us using a ton of metal propelled by a primitive 100 year old technology gushing out fumes on others who huddle at bus stops for the buses that are stuck in the traffic. We will travel along roads covered in potholes, pass cracked pavements covered in debris. Underneath a sewerage system from the Victorian age that floods constantly along with a multitude of social and physical infrastructure in need of repair. Why is no one doing this work. There are again many idle and willing hands and plenty to do in repairing and improving the infrastructure of our environment, in repairing our cities, in using our taxes to make the lives of our citizens easier. This is called development and unlike constant growth is infinite and we can all join in. Jobs are not the answer to our problems, particularly the ones that just produce more waste. We need to work, but work that is meaningful, creative and conducive to drawing back from the damage of constant industrial growth. Most of this work lies at our front door, not miles away in the factory floor or the office block, usually in a job creating and organising the production and movement of more things. As a society we really need to be thinking about how we think about work. The idea of industry employing everyone in jobs is over. We need to think afresh of what work means and reposition it through what needs done in a badly damaged environment, rather than the creation of the kind of jobs in what could ultimately lead to its complete destruction. 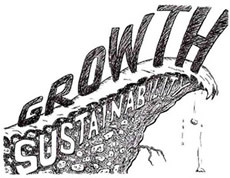 Growth – what our whole economy is geared towards is finite. Sustainable development, what out economy could be geared towards is infinite.